Welcome to the February InKing Royalty Blog Hop. 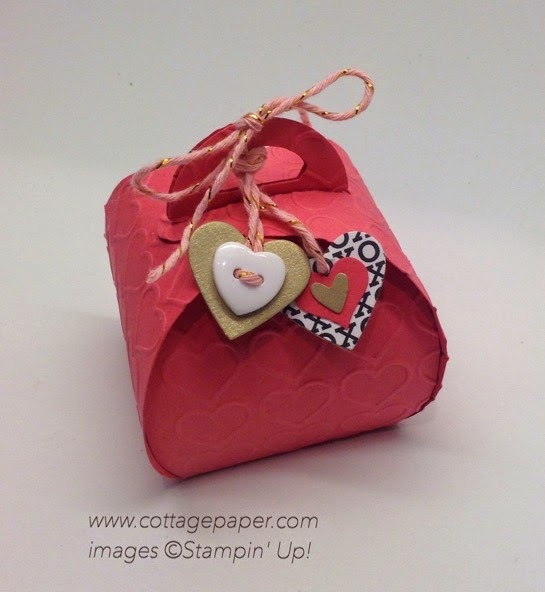 We're excited to share projects that share inspiration for Valentine's Day and our love of Stampin' Up! products. This hop is all about love. You may have started the Blog Hop here or may have hopped over from Kelly DeTommaso at Kelly's Creative Corner. After you read my post, I hope you'll hop over to the next. If you get off track at any point during the blog hop, there's a complete list of participants at the end of this post. One of my favorite products in the new Occasions catalog is the Happy Heart Embossing Folder!! I just love the cute little hearts it embosses all over my piece of cardstock. I think it could be a great card front all by itself or maybe just add a couple of silver or gold hearts punched out with the small heart punch that is in the Itty Bitty Accents Punch Pack. They will fit perfectly over the embossed Happy Hearts. So simple and so classy! I also thought they would look great embossed on a box made with the Curvy Keepsake Box Thinlet. I was not impressed with the Curvy Box Thinlet when I first saw it in the Holiday Catalog It seemed of limited use and it was a little pricey but after I saw all the things that could be done with it I put it on my next order! Last fall I made some autumn themed boxes and someone asked if they could be embossed. After a little experimenting I created a box embossed using the Chevron Embossing Folder. When I saw the Happy Hearts Folder I thought the hearts would look great on a Curvy Box! The Hearts were a little trickier than the Chevrons since the Chevrons have no right side or top or bottom but with a little experimentation I was able to figure it out. First I should say that this is on "off label" use of your embossing folder! It involves sending the folder through your Big Shot sideways ie horizontally not vertically. I had done this in the past with other folders so I knew it could be done. You may notice that your folders are just a little bit too long to fit through your Big Shot sideways. Not to be deterred I also noticed that there is 1/2" or more of extra plastic at the bottom of the folders. I had an old school type guillotine paper cutter and I used it to trim the ends of my folders. This shortened them enough that would then fit in the Big Shot sideways. Then I placed one side of the Curvy Box piece in the folder with the hearts facing the correct direction on the cardstock and had the other side hanging off the edge of the folder. Then I embossed the other side of the piece and repeated with the second box piece. This will result in the bottom pieces of the box being embossed twice which is not a problem since the bottom doesn't show. You can then assemble your box and fill it with treats. Close it at the top and decorate. Here is my box. I used several different punches/dies to create the hearts that decorate my box. Are you aware of all the different Stampin' Up! products that will create a heart shape in your cardstock or paper? I found at least thirteen - five punches (four in the Annual Catalog and one in the Occasions catalog) and eight dies (seven in the Annual Catalog and one in the Annual Catalog). Wow - That is a lot of heart choices!! These should give you plenty of Valentine options. Two of these heart products, the Sweetheart and the Heart Border punches are on this week's Weekly Deals along with Dazzling Diaamonds Glimmer Paper. All are perfect for Valentine projects! I tied my box with pink and gold twine that came in this month's My Paper Pumpkin. When you subscribe to MPP not only do you get fun projects every month but you get fun accessories and other items that can be used on other projects and are not available elsewhere. Thank you for stopping by today. I hope you'll hop along to the next stop on the blog hop, September Gray at September Gray. You certainly won't want to miss any of these projects. What a great way to wrap up today's blog hop. I love this box so much. Your little layered hearts are just perfect. You are so incredibly talented and always an inspiration Katie! Thanks Pam!! Glad you like it since your demonstration of the Curvy Box Thinlit at the World Cardmaking Day event is the reason I bought it! What a super-fun spin on the Curvy Keepsake Box, Katie! I love this. I also love your little buttons and your painted twine - you added some lovely color to the gold twine, right? Thanks Brian! You are super sweet, as always! Actually the pink and gold twine is from this month's Paper Pumpkin treat bag kit, Filled with Love. It is really a great kit and I always love the little surprises that are included in each kit. Very sweet treat "box", Katie! I, too, have shortened some of my embossing folders for just the same reason! And then I buy another one to leave it pristine, LOL! And the heart button is so sweet. Good job, Pal! Thanks Katy! Glad to know I am not the only one. Always appreciate your nice comments! Sooooooo adorable. I love all those hearts!